Bee Pollen - 500 mg, 100 capsules each (Nature's Wonderland) - Penn Herb Co. Ltd.
Bee Pollen is a power-packed source of energizing B vitamins, minerals, carbohydrates, essential fatty acids, protein, and more. No wonder weekend warriors & health enthusiasts everywhere choose Bee Pollen to supplement their active lifestyle! 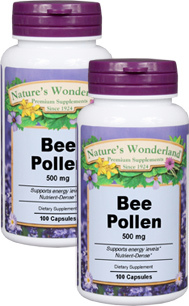 Bee Pollen is a natural substance produced by flowering plants and gathered by bees. This nutritious mixture is considered to be an amazing, balanced health food. Try it for yourself and see what the buzz is all about! Supports immune system function; helps maintain healthy skin; nutritional support for seasonal sensitivities. As a dietary supplement, take 2 capsules, 1-3 times daily, preferably with meals. NOTE: Bee products may cause an allergic reaction in some people. Start with a small serving and increase gradually to assess whether you may be allergic.